Dragon Quest Heroes is far from your standard Dragon Quest RPG. Rather, this game is as much Dynasty Warriors as it is Dragon Quest—and that is in no way a bad thing. Dragon Quest Heroes takes place in the Kingdom of Erusaze where monsters and humans live in harmony. However, one day, a mysterious magical portal opens which turns all the monsters feral. To turn the monsters back to normal and save their world, Act, Meer, Dirk, and Giulietta begin hunting the one responsible for all the chaos. Along the way, they join forces with characters from Dragon Quests IV through VIII who are also on the trail of the mysterious villain for his attacks on their own respective worlds. Dragon Quest Heroes is fanservice in the best meaning of the word. It brings together a group of popular Dragon Quest characters and allows them to play off each other in humorous and heartwarming ways. Moreover, the updated character designs are great and the voice acting truly fits the characters—something that is shown off again and again in the game’s multitude of voiced cutscenes. When it comes to the basic gameplay, Dragon Quest Heroes feels like every other Dynasty Warriors game. You cleave through hundreds of enemies with powerful, flashy attacks. However, built on this base are numerous additions to the gameplay, including magical spells and stationary turret guns you can climb into. As I have previously talked about at some length, the biggest addition to the Dynasty Warriors format is the tower defense gameplay style. While there are a large number of levels that have no other objective than to wipe out your enemy, many levels contain a person or place you must defend instead. However, to win, you must still destroy the enemy spawn points—something you can’t do while defending. This is where the monster coins come into play. Dropped by monsters when you kill them, these coins can then be used to summon those monsters to fight at your side (though some only release their monsters for a single powerful attack instead). Summoned monsters have only the most rudimentary AI—i.e., they’ll simply attack anything in range. However, this is more than enough to allow you to lead your party to take out the enemy spawn points while your summoned monsters take care of the defense. The game play gets more complex as you go on. Some levels have teleporters, transferring you to maps far away from your defense point—and thus forcing you to rely on your monster soldiers all the more. Other maps contain switches, allowing you to raise or lower barriers that in turn force the enemies down certain paths so it is easier to contain them. Simply put, there is a fair amount of strategy to be found in Dragon Quest Heroes. The other area where Dragon Quest Heroes really shines is in its boss battles. Every four or five story missions, you’ll encounter one of these. Each of the battles has some sort of twist to fighting them—it is rarely just hack at them till they die. One boss, for example, is a giant golem chasing two dwarves. Another pits you against an ogre and a huge, flying chimera. Luckily you are given a gun turret or two to even the odds. Each one seems uniquely epic and is a welcome change of pace. Unfortunately, as varied as the combat is, the game is actually rather bare-bones outside of the main story. There are side missions in Dragon Quest Heroes (which are far more straight forward than those in the main story), but no other modes of gameplay. Beating the game provides you the chance to battle powered-up versions of the game’s bosses and gives you the ability to do the new game+, but that is about it. The game even lacks multiplayer—both online and local co-op are completely absent. 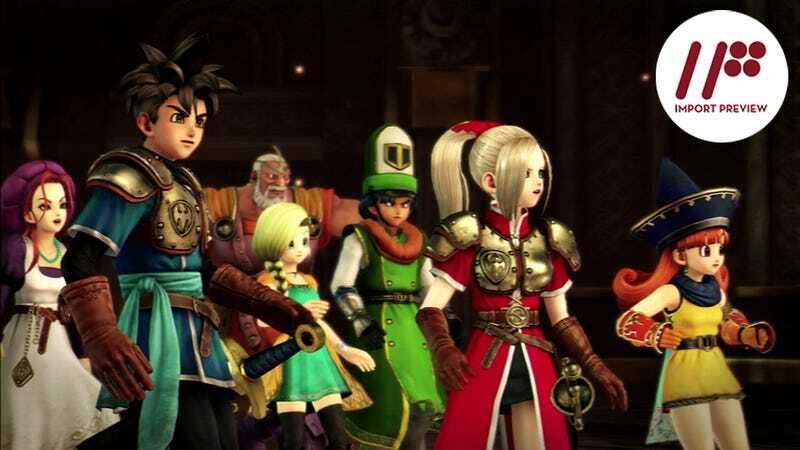 Dragon Quest Heroes is another solid Dynasty Warriors crossover game in the vein of recent hits Hyrule Warriors and One Piece: Pirate Warriors. It takes characters you know and love and lets them naturally interact over the course of a world-spanning adventure. Moreover, as a Dynasty Warriors game, it has several new additions that serve to change up the formulaic gameplay in ways that keep it from feeling boring. To put it another way, Dragon Quest Heroes is a game sure to satiate both Dragon Quest and Dynasty Warrior fans alike.